For the American smasher formerly known as "Hyuga", see Dr. Z.
Hyuga "Huggies, Rey de Plata"
Hyuga (pronounced "he-you-ga") is a Mexican smasher who mains Toon Link in Brawl and Smash 4. He is known as one of the best Brawl Toon Link players in the world along with MJG. 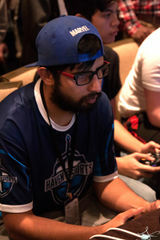 In Smash 4, he is currently considered to be one of the best Toon Link players in the world along with Sigma and Ri-ma, and was widely considered to be the best Smash 4 Toon Link player in the world prior to his hiatus, with results many other Toon Link players have yet to match such as 9th at GENESIS 3, 5th at CEO 2016, and 25th at EVO 2016, and has wins over top players such as Nairo, Ally, MkLeo, ESAM, Kirihara, Zinoto, ANTi, and falln, as well as having very close sets against top players such as Larry Lurr and Tweek. He is currently ranked 3rd on the Mexico City Power Rankings and was formerly ranked 22nd on the Panda Global Rankings. The editor who added this tag elaborates: Brawl tournament history. As one of the most renowned players in Mexico since the Brawl days, he quickly gained notoriety shortly after the launch of Smash 4 by winning various tournaments nationwide, both online and offline by using his old Brawl main. He stayed unbeaten for the rest of 2014, until he finally lost a local tournament to Leo. During early 2015, Hyuga got 2nd place at The Arena, the first Mexican Smash 4 major, losing to Leo at both Winner's Finals and Grand Finals and sparking a strong competitive rivalry which would continue through nowadays. Since then, he has consistently placed 2nd at every national major he has gone to, only ever dropping sets to Leo (typically at both Winner's Finals and Grand Finals), except for Smash Factor 4, Summer Warfare, Thunderstruck and True Combo, where he was beaten in Loser's Finals by Mr. R, Javi, Wonf and Vinnie, respectively. On November 2015, at CGX, another Mexican major held at Monterrey City, Hyuga was the first player to take a set from Leo since the start of 2015, when he beat him 3-2 in Winner's Finals; however, Leo would face Hyuga again at Grand Finals, resetting the bracket, forcing a second set and ultimately taking yet another tournament from Hyuga in the closest set they have ever had (a score of 3-2, in favor of Leo). On January 2016, at GENESIS 3, Hyuga took a set from Nairo, beating him 2-0 and sending him to the losers bracket. He placed 9th in singles and 7th in doubles with Dabuz as his partner. He had a very notable performance at CEO 2016. He eliminated Nairo from the tournament to advance into top 16. He then defeated ScAtt, making a reverse 3-0 comeback after being down 2 games. He went on to 3-0 NAKAT and False before losing to Zinoto 1-3, placing 5th. After a long hiatus from Smash 4 since the incident at EVO 2016 (placing 25th at singles), he returned to play Smash 4, with his first tournament appearance being Hail VIII: The Return of the Heroe of the Wind, placing 1st in singles and doubles with BryanZ. After that he continued to attend locals and regional tournaments in his region, with top 8 at many of them, such as 2nd at Tijuana at War and 4th at The Arena 2017 and Smash Factor Toluca. At Smash Factor 6, Hyuga made it to round one of pools and qualified for top 128. However, he lost to Rox 2-0 and was sent to losers bracket and had to face Anti to get into top 32. He lost 2-1 against him, placing him at 33rd, which marks as Hyuga's lowest tournament placing since EVO 2016. The editor who added this tag elaborates: Brawl results? The Arena 2016 March 25th-27th, 2016 2nd ? ? At EVO 2016, Hyuga lost his sponsorship with VGBootCamp due to allegations of sexual harassment towards a fellow smasher and streamer VikkiKitty. In response, it was later announced that Hyuga was banned from taking part in any American tournaments for a full year, with both the Brazilian and Australian tournament scenes also banning him. Hyuga wrote a response explaining his side of the story, adding that he would be retiring from competitive Smash. He later announced that he and Vikki had discussed the incident, and that he would consider returning to Smash in the future, though he would still accept all consequences and punishment for his actions. In October 2016, Hyuga declared his comeback in the Smash 4 competitive scene in January 2017, which occurred at Hail Smash VIII: The Return of the Hero of the Wind. He also began tweeting again after several months of inactivity. Ultimately, following EVO 2017, his ban has since been lifted. Hyuga became a heated controversial topic again in late October 2017 when discussions of who should be flown out to 2GGC: MkLeo Saga began. Some people were supportive of Hyuga attending more events in the U.S. for reasons such as that he already served a one year ban, he has had rehab since then, he should be forgiven when also the victim has forgiven him, and he has already attended multiple tournaments normally since his hiatus. Other people were not supportive, for reasons such as that the one year ban was just a suggestion and not a concrete rule, someone capable of sexual harassment is not to be trusted at future public events, people would feel unsafe around him and not attend events with him, and he was already lucky enough to not get legal charges against him. 2GGaming made a statement on October 22nd, 2017 that their Hyuga suspension is still active for them until further notice, in the interest of wanting a safe environment. Smash United controversially announced on October 24th, 2017 that Hyuga would not be allowed to attend the upcoming Clutch City Clash 2 mere days before the event, after Hyuga already checked beforehand if it was okay to come and was already planning to fly over there. At CEO 2016, Hyuga entered the top 8 wrestling ring dressed as El Santo, the famous luchador. He also used an in-game tag bearing his name. Hyuga was the second non-American member of the VGBootCamp crew (though he lost his sponsorship). The first was aMSa. Along with KEN and Taiheita, Hyuga is one of the three players of the Panda Global Rankings v2 not to attend 2GGC: Civil War. ↑ Global Smash 4 Leadership Group's Response to Hyuga Incident. ↑ The problem with Vicky is over..
↑ Hyuga suspension is still active..
↑ Regarding Hyuga and Clutch City Clash 2. This page was last edited on March 5, 2019, at 19:01.